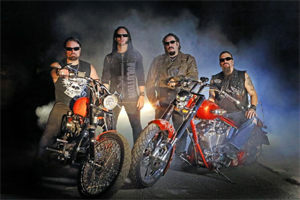 Riding on the release of their latest album, Men of Honor, ADRENALINE MOB hits the road again this spring. The quartet has continued to reaffirm their supergroup status with the addition of TWISTED SISTER drummer, A.J. Pero, as they deliver a gut-hitting hard rock sound. As the band hits the road, Orlando doesn’t see any rest in his future. “My philosophy has always been - we’re done touring, I’m going to go home and start writing another album. It’s just non stop,” Orlando says. ADRENALINE MOB will be making their first appearance in Madison at The Annex at the Red Zone on April 12 and in Chippewa Falls at Every Buddy’s Bar on April 13.